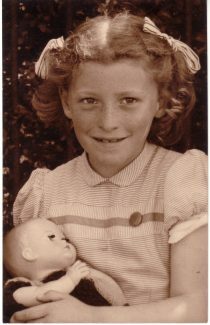 I started at Markham’s Chase school in 1951 in Miss Mayhew’s reception class along with my cousin John Devine. His father, Richard Devine, my uncle, was a teacher at the school at that time. The class was large because of the post WW2 baby boom. (I note from my leaving report of 1957 there were 47 children in my class). The midday assistants were Mrs Temple and Mrs Randle who supervised us during break times and helped us with our games. ‘The Farmer’s in his Den, Dashing Round the Dusky Blue Bells, Oranges and Lemons, What’s the time Mr Wolf and Queenie Eye, Queenie Eye who’s got the ball? I still remember the words to those songs we sang as we skipped around in the sunshine on the grass playing field that was scattered with buttercups and daisies. While in the infants, I often travelled to and from school in a little seat on the back of my Dad’s pushbike. Sometimes we were overtaken by a pony and trap driven by a man taking his children to school. At the school gates, the children would open the side door of the trap, climb down the step, close the door behind them and the pony would trot on again. I believe the family were called ‘Daniels’. I was very exposed on the back of my dad’s bike in the winter so was warmly dressed in such a way that only my eyes could be seen peering out from inside my hooded scarf. One morning the mood in school was very sombre and the male teachers were wearing black armbands. In assembly we were told that the King had died and his daughter Elizabeth would be crowned Queen. We didn’t have a TV set at the time (we got our first set in 1954), however, the whole school were taken to see a film of the Coronation at The Radion Cinema in Laindon High Road. Miss Whitley, head of infants, explained that the accompanying film was ‘Popeye and the 40 thieves’ and we mustn’t be afraid when the thieves chase Popeye with knives, as he gets away safely in the end. I was 6 years old and we walked all the way from the school to the cinema and back. The Coronation film was interesting but very long and to be honest I think most of us enjoyed the Popeye cartoon the most. I went into Mrs Sparey’s class in the juniors. I particularly liked the music in the morning assemblies. We marched out of the hall, class by class accompanied by Miss Pike playing the piano ‘In an English Country garden’. While we waited our turn to march out, we were allowed to clap to the music but only with the two fingers of our right hand against the palm of our left hand, which made a soft sound. I was in Mr Stanley’s class in the 2nd year and Mrs Sparey’s class again in the 3rd and 4th years. Our classrooms were always painted during the summer holidays and we would be keen to see the new colour when we returned for the September term. While in the juniors, I travelled to school by bus which I caught at ‘Sizer’s’ bus stop in Laindon High Road, near King Edward Road. The children from Laindon Park School who we knew as “Donaldson’s” or “Donald Ducks” were dropped off first and the bus then continued down the very steep St Nicholas Church Hill where we were dropped off and then walked the length of Markham’s Chase to the school. The two schools were differentiated by the colour of the blazers and PE kit. Ours were navy and white, Donaldson’s were bottle green and white. I had 6d per day. 2d for the bus fare to school, 2d to spend in Lawrence ’s tuck shop (I always bought a Wagon Wheel) and 2d for my bus fare home. In summer, I would sometimes walk all the way home and save 2d. On days of heavy rain, an enormous puddle formed in the road outside the school which we had to wade through. In summer when the verges of Markham’s Chase were alive with wild plants, I remember being scared of stories about ‘Deadly Nightshade’, Stinging Nettles and Snake Grass (Wild Parsley), which if we touched (I was told) a huge snake would come out and chase us. I think I used to run all the way from the school to the bus stop! Nina age 9 complete with braces on teeth. Sports day was held each year on a Saturday afternoon. All children attending whether taking part of not were given a doughnut and a glass of lemonade. Novelty races included three legged, egg and spoon, wheelbarrow, skipping, bean bag, a ‘slow bicycle race’ and a ‘soapbox derby’. Those homemade vehicles were mostly orange boxes fitted with pram wheels, with one boy sitting inside steering and another boy pushing. Miss Duke, the Head Mistress, presented the winners and runners up with their prizes. Christmas was also a fun time. We decorated our classrooms with paper chains that we all helped to make. Our parents provided the food treats for our class party and the teacher provided the orange squash. This was followed by various party games. The Nativity assembly started with the school choir walking through the corridors to the hall, singing and holding a lantern aloft. I joined the choir in the 4th year and thoroughly enjoyed it. Miss Pike was an excellent choir mistress and we took part in the School Choir Festival at a school in Benfleet. I still remember the songs and their words. We sat the 11 plus exam during the 4th year. I didn’t get through but wasn’t too disappointed as I knew I would be going to Laindon High Road School with many of my friends and the school was so close to where I lived, that I would be able to go home at lunch times. My uncle, Richard Devine, also left the school that year to take a teaching job on the Isle of Wight, where he and his family settled. (The name of our school was so long that we sometimes shortened it to “Laindon High”). On the first day, all the new children assembled into the hall to be allocated their classes and teacher. Mr Woodward the Headmaster asked each of us our names and never forgot any of them. I was in Mr Rosen’s class, Upper 1b. Mr Rosen taught English and introduced me to poetry which I loved. Two of my favourites being ‘Home Thoughts from Abroad’ and ‘Cargoes’. We were also put into one of 4 team houses for the duration of our school days. Shoreman (Green), Hillsman (Yellow), Townsman (Red) and Plainsman (Blue). I was in Shoresman. In the afternoon all the 1st years again assembled in the hall and formed ‘The Circassian Circle’ which was an introduction to Country Dancing that I enjoyed immensely. I also enjoyed Miss Jollyman’s nature study lessons so much that I won the 1st year prize and was presented with the book ‘Heidi’ on speech day. Playground games were seasonal and included, skipping, marbles, two-balls and flick cards. Most of us girls had our own netball which we carried around in a string bag. We practiced scoring goals in the goal posts in the playground and also I might add, in the curved shaped lampposts along Devonshire Road. Once a ball I was playing with went over the fence of the playground into the garden of a bungalow on the other side. I had to go and knock on the door to ask for it back. The lady was very kind and retrieved it from her back garden for me. We were taken by coach for our swimming lessons to a pool in Hutton. Towards the end of the year it was decided that the school should have its own swimming pool. Second Year – 1958/59 . I was in Miss Burt’s class that was in one of the wooden buildings used as the dinner hall. She was a needlework teacher and I learnt a lot from her. With our parents’ agreement, all pupils paid one shilling each week for a year to raise the £1,000 needed to build the swimming pool. We each had our own little payment book. That year hoola-hoops were the craze and the playground became a colourful sight of gyrating girls. During our class Christmas party, we encouraged Miss Burt to have a go. She did, but after a few comical attempts, just could not master the technique, much to our amusement. We were taken on a trip to Sadlers Wells Theatre to see the Children’s Opera ‘Hansel and Gretel’. We learned one of the songs in Miss Crook’s music lessons – “Brother come and dance with me”. During the performance I nearly fell of my chair when the witch made her entrance in an almighty loud flash and bang. I joined Mr Wood’s very large choir. No audition required we just had to turn up and we were in. I was in Mr Hawkins’ class which was in the typing room. When we lifted our desk lids, the typewriter housed beneath was revealed. Work had began on building the swimming pool and on the buildings which would contain the new art room. We were able to use the swimming pool when it opened in 1960, although without a roof, it was a bit chilly running to and from the changing rooms in winter. A roof was added a few years later. During this year, we had to decide whether we would leave at 15 or join an extended Commercial or Technical course and stay on until 16. I decided to stay and joined the Commercial Course, which included shorthand, typewriting, English and office studies. There were two extended classes 4X and 4X2. I was in 4X with teacher Mr Durrant. Miss Maitland taught us shorthand and Mr Hawkins taught us typewriting and office practice. I really enjoyed typing and haven’t really stopped since. My claim to fame during the course was achieving 100% accurately in a typing speed test, which wasn’t easy on a manual typewriter without a correction button and with a carriage which had to be returned at the end of each line. I was awarded an honours certificate which hung on the wall outside Mr Woodward’s Office until my leaving day. We were all encouraged to take part in at least one event for sports day. The field events were held one afternoon. I had a go at throwing the discuss and as mine went the furthest, I won. The track events took place a few days later during the evening. I was proud to see my name in the programme and was called to go up and collect my medal. (Unfortunately I didn’t keep a copy of that programme). Miss Wood, the PE teacher took me along to district sport day. However, I didn’t get to take part as my discus winning throw was nowhere as far as the required distance to take part. However, my medal lived at home in a display cabinet until 1975 when my parents moved house. It was mislaid then and never found. Gregory Pead and Irene Peall were voted Head boy and Head girl. A very popular and well-deserved choice. Many of the girls were reluctant to take part in sports day that year, considering athletics to be ‘unfeminine’. A small article appeared in the Laindon Recorder about that. However at that time three young athletes in training went on to win Olympic medals – Ann Packer, Mary Rand and Lillian Board all of whom couldn’t have been more feminine. I remember in one PE lesson, a group of us girls linked arms and attempted to emulate the Tiller Girls. I doubt if any of us could do high kicks these days! One afternoon Miss Wood sent a group of us girls on a cross country run. We were to go up Archer Road and run across the fields at the back of the school towards Dunton. However, little did she know that I lived in that area. We jogged along until we reached Spion Kop. We called in, to my mum’s surprise and spent a pleasant time jiving to Cliff and the Shadows’ records played on her radiogram. After a glass of orange squash, we set off back to the school, running the last few yards and arrived hot and out of breath. Miss Wood said ‘Well done girls’! 5X on leaving day 1962. Back row from left. Eileen Clayton, Janet Gipson, Tony Trew, John Bird, Pamela Patrick, Sheila Spooner, Glenn Cunningham, Joan Hewett. Front from left. Janet Barratt, Nina Burton, Graham Godward, Philip Thomas. I was in Mr Gay’s class that year. A privilege of being in the 4th and 5th year was being a prefect and allowed to stay in the quad at break times. We took our typewriting, shorthand and English exams, which I’m pleased to say I passed. We had an enjoyable leaving party in the hall, where we wore our best fashionable clothes and danced to the music of the day including a favourite ‘Kontiki’ by the Shadows. Many pranks were played on leaving day including a teacher’s chair being put on the roof. 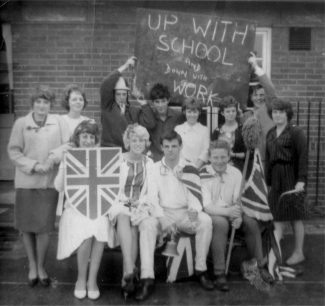 In the afternoon a group from my class took one of the ‘milk floats’ and paraded around the school with a placard reading ‘Up with school and down with work’. When the bell rang at ten to four, we headed home to face whatever the future had in store for us. Hi David. Good to hear from you and a nice surprise. Of course I remember you and the other David MacDonald. I can’t remember putting anything on the wall about you, but it’s a long time ago. I certainly never thought you were ‘drippy’ so I would only have been teasing and apologise for that right now – I’m very sorry. I always thought you had emigrated to New Zealand, so was surprised to learn you went to ‘Australia’. I expect by now you will have learned that our school was demolished several years ago. I doubt if you would recognise Laindon now as it’s changed so much. I’m pleased you found this website, there’s a lot of good stuff on it. I wrote an article called “Photographs of 5X and 5X2 1962”. I hope you have found that one, as you may recognise some faces on there. I will ask one of the Editors to pass my e-mail address on to you so we can do some catching up. With very best wishes. You won’t remember me. I was in your class (Mr Durrant’s) and emigrated to Australia after a short time in Essex. You were really into typing and used to type things and put them on the wall about me being ‘drippy’ or something (There was another David MacDonald, a local guy, so don’t get us confused) Really enjoy this page. Are you still active on the site? 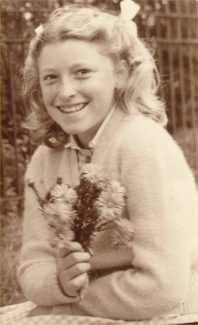 Hi Nina, We cross paths again as I am married to Susan Hewett whose sister Joan appears in your 1962 leaving photo. Regretably Joan passed away at age 34 leaving 3 young children. She was married to a farmer here in Western Australia. Richard. I’m so pleased we share memories of the same time and place. And even more pleased that everything is being recorded for the future. Eric. I heard the news about Joan a few years ago. So very sad. She was a lovely girl and I liked her very much. Nina, I have only just read your article on your school days, without realising it was on this site. You were one year ahead of me all the way along, from the bus to Laindon Park and Markham’s Chase all through to LHR where you left the year before me. I remember Irene Peall and Greg Pead being head girl and boy when I was in the fourth year. As you say it was good being a prefect, using the quad at lunch time and in breaks. One day I will write down all my memories of the schools as well – including being in a fight on that field between King Edward Road and Powell Road and coming off worse – could have been the same bully. Brilliant that you had Mr Rosen in the first year U1B just like me and that you had the same poems including Cargoes. I guess the same formula worked for him year after year. So, Nina, we are just two of the talented Laindon High Road kids from that era, what a special place. Take care.